Group bookings must be cancelled at least 1 week prior to arrival otherwise the full amount of your stay will be charged. Please contact us directly to discuss the details of your stay. Group bookings are charged an additional surcharge and full payment for your stay will be charged to your credit card one week prior to arrival. Please contact us directly for further information. ROOMS AVAILABLE FOR THE LANEWAY FESTIVAL WEEKEND, FEB 7! We are conveniently located just a short bus ride away from Venue in Rozelle! Set in beautiful leafy gardens, our two terraced houses are heritage-listed. 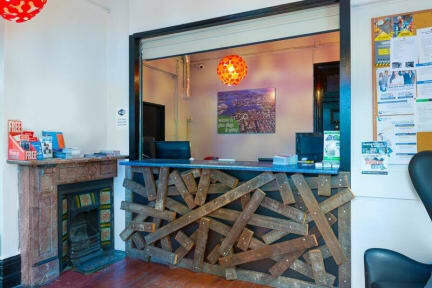 Unique in style and character, VLA Glebe has a fantastic atmosphere and professional local staff. Free daily breakfast is included! We are ideally located on the north-western end of Glebe, a relaxed leafy suburb in the inner west of Sydney where parks and the water are a short 5 minute walk away. 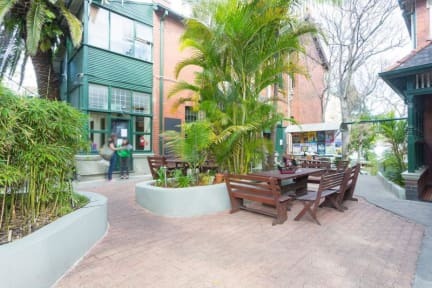 If you like the idea of a hostel located outside of the hustle and bustle of the city, with loads of cafes, restaurants, bars and bookshops, but no more than a 10-15 minute bus ride into town, then VLA Glebe is for you! There's always plenty of opportunities to meet other people in our front courtyard or on one of our many fun activity nights, like our free BBQ on Thursday nights! Our free events are a great chance to chill out and drink a few beers or punch with your fellow travellers. We also have free breakfast every morning! During the week and on Saturdays there is ample supply of bread, cereal, spreads, milk, and tea and coffee. On Sundays there are pancakes and maple syrup provided. Our rooms have heaters and fans. They are cleaned daily, are spacious, and many have new polished floorboards. Our dormitories range in size from 4 to 6, and 10 beds.